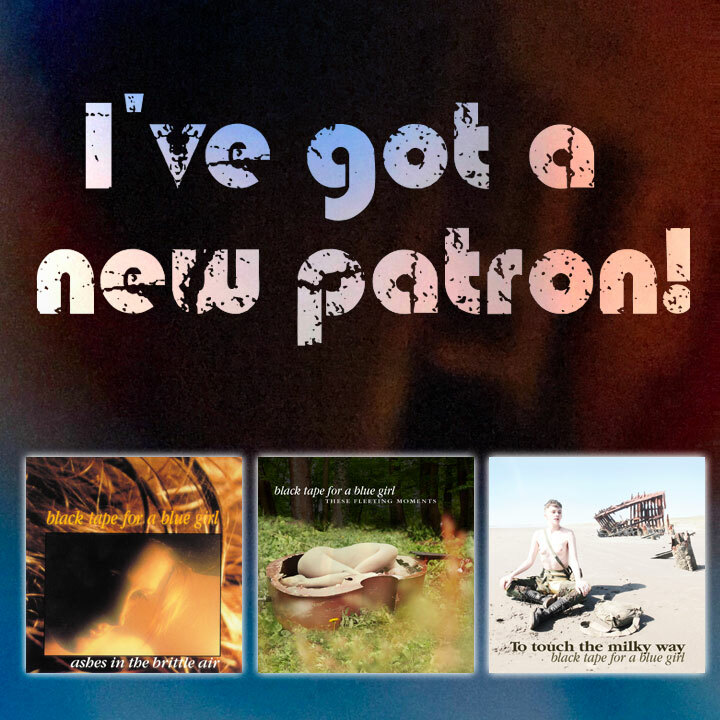 My Patreon backers give a small monthly donation, to help fund the creation of my art. They get additional private blog posts. You can join for as little as $3 a month. It’s a really nice way to keep the art flowing. 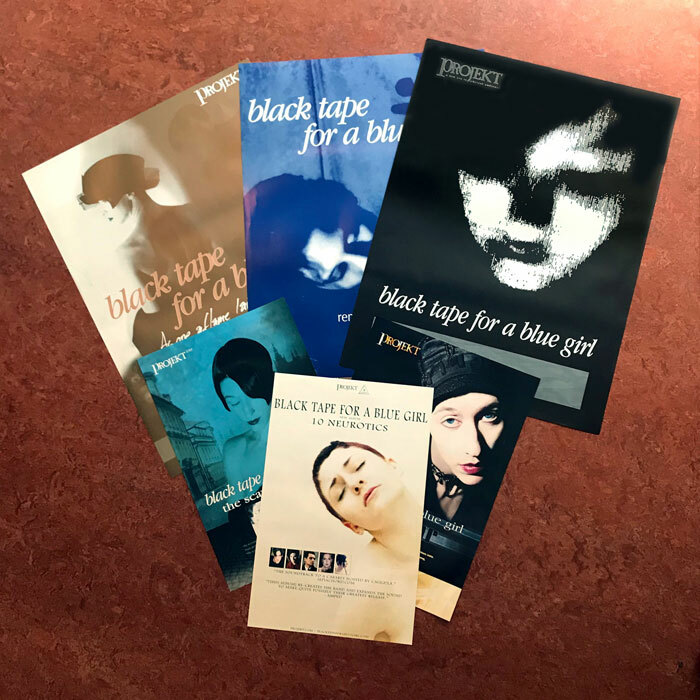 I’m digging in the storage space, finding cool vintage Black tape for a blue girl memorabilia for you. Today, I have a set of six posters for $60. 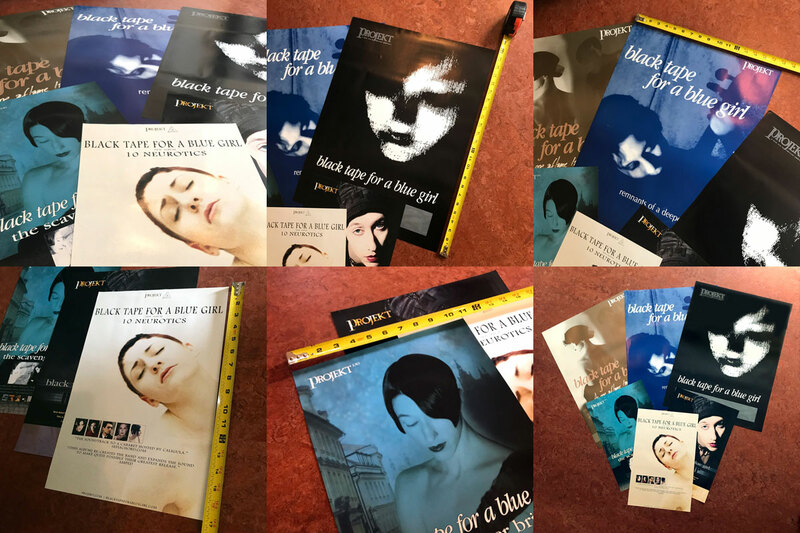 Six vintage Black tape for a blue girl Posters. 3 large format (24×17″), 3 medium (11×17). These were stored flat, in quite good shape; but there could be some bent corners or waving from the years. Sold AS IS, but like I said, quite good shape for how old these are (10-20 years old!). Large: the Rope, Remnants of a deeper purity, As one aflame laid bare by desire. 11×17: the Scavenger bride, Halo star, 10 Neurotics. I have around 25 of these sets available. I’m regularly packaging up orders with CDs, LPs & Merchandise. I enjoy that. I like knowing BlackTape’s music is going out to people, that it’s going to be enjoyed. 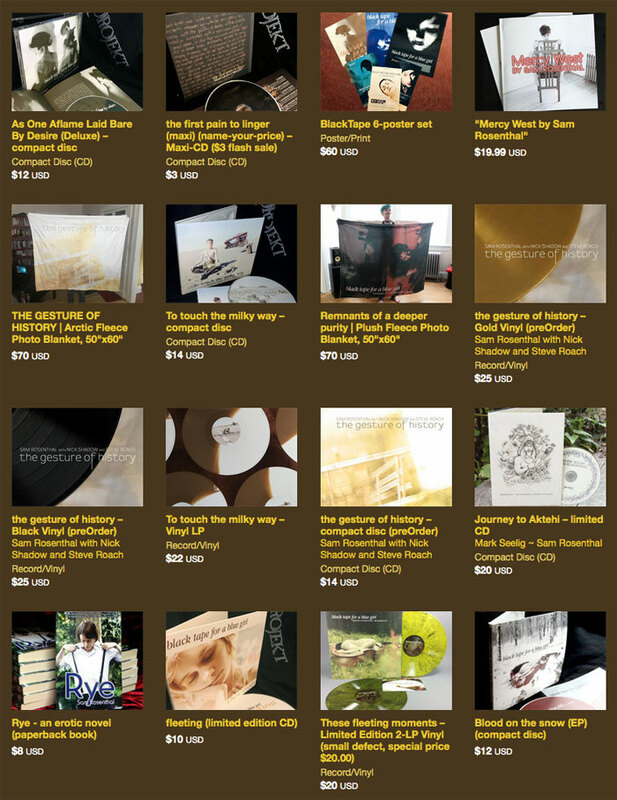 See what I have available at our merchandise store at Bandcamp. You did it! We reached the goal with 24 hours to go. 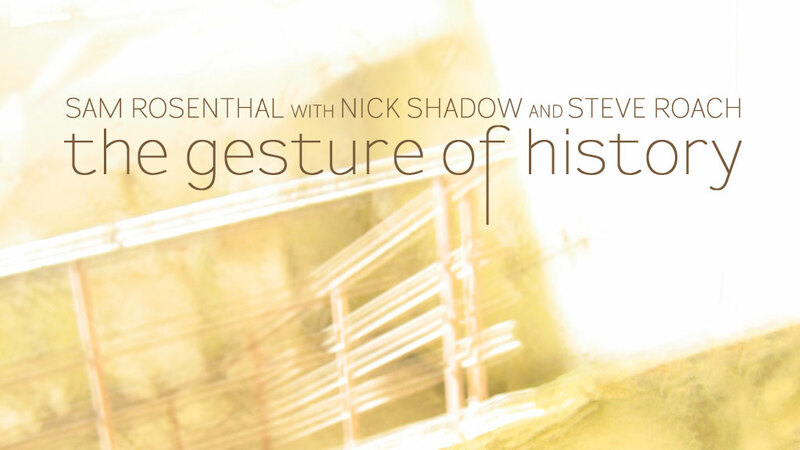 Your support made the The Gesture of History crowdfunding campaign a success! 265+ amazing people said, “Yeah, I like this! 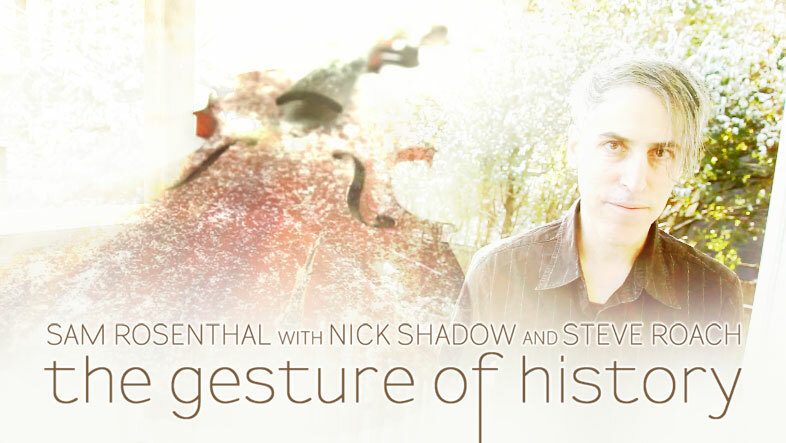 I want to be one of the backers that ensures there’s a physical CD & LP!” That’s remarkable! I’m so grateful. 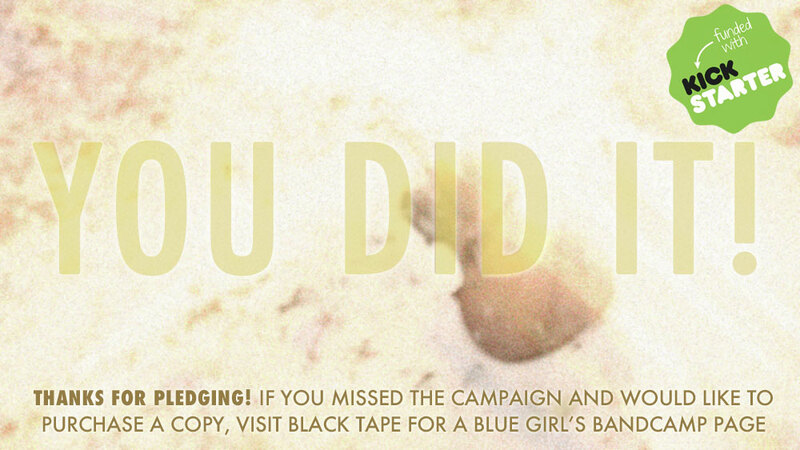 If you missed pledging the campaign and would like a copy, visit our Bandcamp page. My Patron backers are listening to something quite amazing. 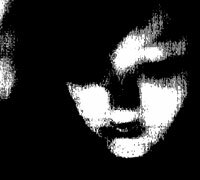 It’s a very different first version of Black Tape For A Blue Girl’s third album, Ashes in the brittle air. Let me tell you more about it. 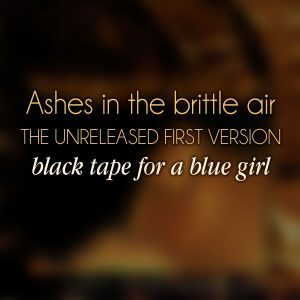 Ashes in the brittle air (the previously unreleased first version) is not recognizable as the album you know; this is a chance to hear a different 3rd Black Tape For A Blue Girl album. I scrapped this version, cut it apart, salvaged some tracks and reworked others. There are five unreleased songs, along with versions of six songs that appear on the final album. What you’re hearing is unmastered; it really needs an engineer to pull it together to sound coherent. But for the moment, it’s an interesting artifact from the late 80s. Something quite different to begin the year of the album’s 30th anniversary. Let me tell you the story of why this version of the album never was released. I lived in Orange County, California, when working on the Ashes in the brittle air album in 1987/88. I moved from Florida in ’86 for my last 2 years of college. Over the course of recording, I graduated and started my first full-time job. I was 23; I worked on music nights and weekends using the analog 8-track in my friend Walter Holland’s studio. I believe I met Loren through a letter he mailed after hearing my 1985 Tanzmusik solo-electronic LP. I loved Oscar’s vocals on the first two BlackTape albums; there wasn’t a problem that led me to look for a different vocalist, it just seemed like a cool idea to find a local bandmember to work with. Loren suggested we reuse two tracks from Tanzmusik as backing tracks for new songs (“The Return” is renamed “We return,” but is not the “We return” that appears on The Rope. “Year 90-10” became “Let the rainfall.”). When looking through my cassettes of rough mixes, the first two songs we worked on together are “We Return (from Loren’s 8-track)” and “Pop song (through sky blue).” They are both attempts at writing more commercial tracks. The early version of “Sky blue” with Loren (and no Sue), is bonus track #14. I know we worked on it for a while, but it just didn’t gel for me; I rejected it before the album was mixed; but for a long time it was slated to be included. At the time (and still today) “Return” and that version of “Sky Blue” sound amateurish, they’re trying to be new wave, new romantic pop. I do like Loren’s vocals on “We Return,” but we threw in the kitchen sink in an attempt to succeed; the songs just don’t come together. Hey, I’m not blaming anyone but myself, I played the music on them! To me, they seem like Loren and I getting to know how to work together. Usually, I’d scrap the dodgy pieces and write better ones. With Loren coming over regularly to work on music, I’d try to change the things I didn’t like or didn’t think sounded BlackTape-enough, but I had a hard time getting rid of these two tracks. On the other hand, I was excited when we hit on pieces that worked well, that’s why we kept working on music together. Of the songs I removed from the album, I think three worked nicely. “Let the rainfall” and “The sound of waves” are moody and image-evoking track (“Waves” is the first song I played guitar on). Loren brought in the track “Milan” already formed. We recorded it in Walter’s studio, I added some synths, but that piece is almost all Loren, and it’s lovely. These three would have made a nice EP, come to think of it. Songs were coming along, lyrics were getting written, and Loren’s vocals were recorded. I flew to England to record Sue Kenny-Smith on the songs written for her. Sue improvised “Is it love that dare not be?” in the studio. I don’t know if she’d already written it, or if it just came to her in the moment. She played it the way you hear it. One take most likely. Nice! But back in California, Loren & I were having disagreements. We were butting heads about the songs. I felt there was some good material, and some stuff that should be rejected and replaced. Yes, we worked hard on those tracks, but I think you have to be bold and not cling to the mediocre pieces, especially when they stick out in comparison to superior tracks. They needed to be tossed to make room for something better. Also, keep in mind this was planned as an LP, there was a 40-minute time limit. The other issue is a bit more personal. BlackTape is my band, I didn’t feel I should have to have disagreements with other people I invited to participate and assist me. I’ve never given others final say in BlackTape. It’s always my decision on which pieces make it onto the albums, or who sings which song, etc. Loren was not happy with what I wanted to do. I felt the album was weak in places, and his lyrics were New Agey and not in sync with the lyrics I wrote. I wanted to make changes to get the best album I imagined. Part of the problem is expectations. Over the years since, I’ve never recorded vocals for a song I didn’t believe in and felt might not go on the album; I never want to waste a singer’s time, have them think their performance was going on the album and then let them down by cutting the track. On Ashes, it seems everything that was worked on was getting shoved onto the album, and that was a problem. Now let me stop for a moment, and be realistic. I don’t want to write this like I’m the hero of the story, and Loren is the bad guy. This is about artists making art, and having different visions; a difficult situation. Creativity is subjective, and perhaps if Loren had been in charge of the album, and I was in his band, it would have turned out to be something quite interesting. But it wouldn’t have been Black Tape For A Blue Girl. I am the director of this band (true, at that point it was only three years into the band’s existence; but there were already two albums out, and before that I had recorded 10 instrumental cassettes.) I had an overall vision, I knew what was or wasn’t the 3rd BlackTape album I wanted to make. To be fair, Loren was enthusiastic about collaborating, and he strived to have the music exist the way he wanted to hear it. He was doing work he believed in, and standing up for his ideas. I know now I could have been more clear from the beginning about how I envisioned the collaboration. I messed up letting it get too far away from my initial idea of working together. These are things I see clearly in retrospect. I was just 23 at the time. By late summer 1988, the mix was finished, and included songs I didn’t believe in. Plus there was another problem. Walter Holland had assisted me with mixing Mesmerized by the sirens, this time I did this mix myself. It showed! The engineering on the multi-track recordings were not great, and the final mix was shrill. I just didn’t know a lot about sound, from a technical perspective. I recorded to 8-track tape, then mixed through an old 16-channel board to an 2-track open reel. There was a lot of knob moving that needed to be done in real time, and fader fading, and sending to reverb and delay. It was tough to do a good mix of a track start to finish, especially as there was no compression available. I was trying to ride the levels on the tracks along with everything else, because the volume levels were all over the place. This shrill mix – completed after a straight week of work – was just one more problem with the album that pushed me to a breaking point. I was dissatisfied with my mix, and dissatisfied with a number of the songs… I did what artists always do: I freaked out! Loren and I had a falling out (though I cannot remember the particulars of that), I cut a bunch of songs and wrote new ones. Cassette Vol 10 is named “Post Seperation 1988.” I remember calling Oscar, stressed and anxious, to ask if he’d sing the new track “Across a thousand blades” and “The Scar of a poet.” These turned into two of the best known songs from the band’s first five albums. When listening to the final version of “Poet,” I know definitively that Oscar is the person meant to sing the song. It’s a perfect showcase for his style and voice. I was motivated by the pressure of having only half an album completed; I created a number of new songs quickly, and reworked a few of the existing ones to remove Loren’s contributions, and pull something interesting out of the recordings (“Ashes in the brittle air” and “Through sky blue rooms” were especially nice in stripped down form; another piece with Sue turned into “You tangle within me.”) I wanted to keep everything I recorded with Sue, as those three hours in the studio were so productive and beautiful. Listening to the final album today, I regret that Oscar only sings two songs; I should have asked him to sing some of the ones on the 2nd side, or written a few more for him (imagine if I had written another couple songs like “blades” and “poet!”). 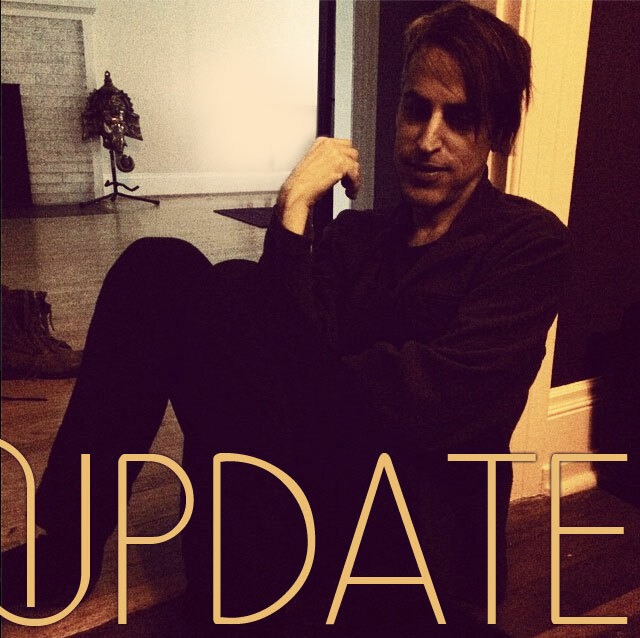 I probably felt a time crunch to get the album done, after the delay with the first version. The first two BlackTape albums came out a year apart (86 + 87), and now it was looking like the release date would be two years after Mesmerized. The album came out in 1989 as the band’s first CD release. The album changed dramatically from the first version you’re now hearing. I achieved what I set out to do: revamped the album into something that felt like Black Tape For A Blue Girl. This first version of Ashes has never been heard by anyone but me. A fan (Randy!) asked for many years that I release it. In 2015, I sent the 1/4-inch 2-track mixes to my guy in Canada who did a super high-quality transfer to digital. It was quite expensive (thanks Patrons for paying for that!!) and only confirmed what I remembered: my mix was thin. And not very good in places. In my studio I went back to the cassette rough mixes and transferred them to digital. On some tracks, the roughs were better then the final mixes. 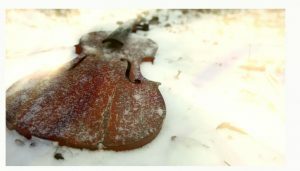 What you hear is some of the finals and some of the roughs, and occasionally I blended in bits of the rough over the final, to bring back an instrument or effect I had removed. As you can tell from that, I didn’t have a finished master of the album to work with; I reconstructed this from my notes and from digging through the cassettes. It was daunting, and at times tedious, and I’ve procrastinated for many a year. The 30th anniversary seems like a perfect reason to get this to you, at last. Listening to this now, for the fourth day in a row, I don’t dislike the tracks as much as I did in 1988. I still know it’s not the record I wanted to release then, and I don’t regret my decision to rework it. As a sonic archeologist, I find it interesting to listen to this artifact, 30 years later. Ashes in the brittle air (the previously unreleased first version) flawed, but close to the way I heard it in 1988. I’ve been thinking about this slice-of-life from my novel, RYE… click here for a more readable jpg. .
Purchase from Bandcamp or eBook at Amazon. Hi. I posted an update to the To touch the milky way Kickstarter. I talk about the shipping date growing closer, sending out the download codes later this week, and being saved by a random thought. If you’re one of my generous patrons at Bandcamp, I posted a thought about anxiety regarding creating, and wondering who is this critic in my head? My 58 supporters help me create by donating a little bit towards my costs as an artist. Very cool. Whichever way we connect, it’s all very cool. It’s nice being in touch with all of you who care about my art, and want to see me make more of it. This post serves as your last call to get in a preOrder for the Remnants of a deeper purity T-shirt reprinting. If you want one, order at the Projekt webstore so I know how many to print. The second pressing of the 2LP vinyl is also available on that link. The image below isn’t exactly the final blue color, but it gives you a good idea of the shirt design. Available in all sizes: small to 2XL. 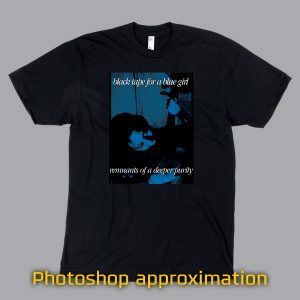 We’re getting closer and closer to the release of the new Black tape for a blue girl CD/LP, ;To touch the milky way. It is available for preOrder at the BlackTape Bandcamp store. the Projekt website, and also our new Projekt European Website. I’m reading the latest book from my favorite Jungian analyst, James Hollis, Living an Examined Life: Wisdom for the Second Half of the Journey And also Craig Ferguson’s autobiography, American on Purpose: The Improbable Adventures of an Unlikely Patriot. You can guess which one has more laughs. We’re two months away from the release of To touch the milky way, the new album from Black Tape For A Blue Girl. The CD + LP are up for preOrder at the BlackTape Bandcamp store the Projekt website, and also our new Projekt European Website. I’ve set up the preOrder on the second pressing of the 2LP Remnants of a deeper purity (with the 8 page booklet) and a reprinting of the classic ’99 Remnants tour shirt. Both at the Projekt webstore. European fans can get the LP from the Projekt Euro Website. 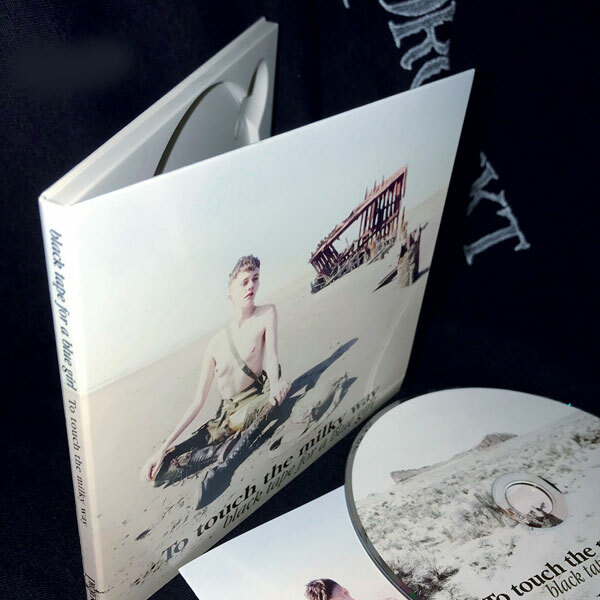 To touch the milky way is an ethereal, darkwave, dreampop album. 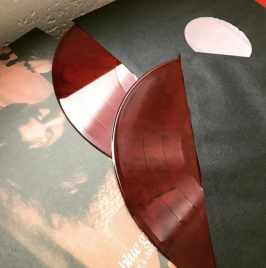 Like many Blacktape albums, each song is in a somewhat different style, which gives vocalists Michael Plaster (SoulWhirlingSomewhere) and Danielle Herrera opportunities to explore and stretch, bringing you and them to new places. The songs… oh? It’s so hard to explain what the songs are about in one sentence. I’d say the lyrics are influenced by questions I ask myself. I’ve created characters who question where they are at, is this the life they wanted? Wondering how to move forwards, or if it would be better to abandon the path they’re on and start something new. We all feel that turmoil, frustration and anxiety. Where are we? Is it where we expected to be at this point in our life? And are there other choices that could be made? Musically, this is one of the most “solo album” Blacktape albums I have created. 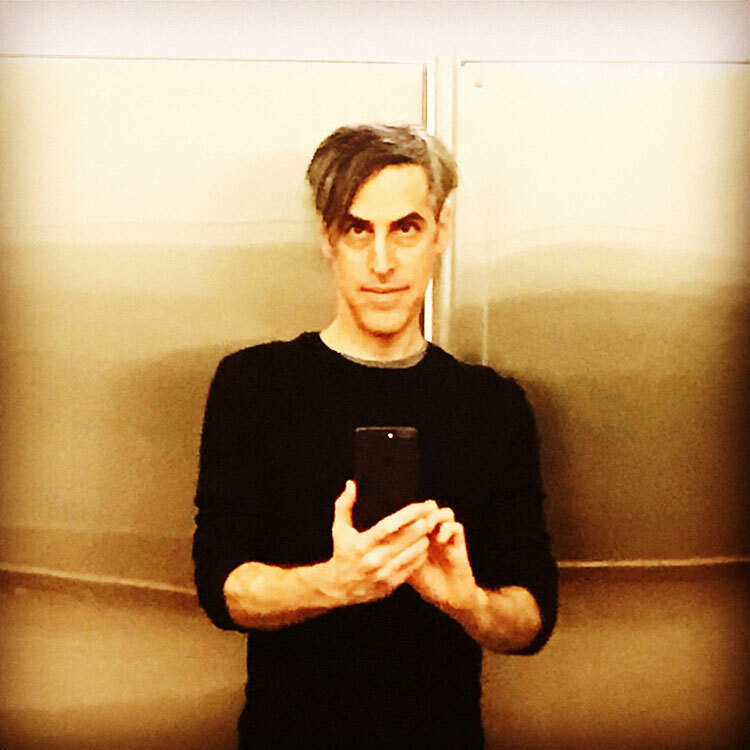 There are appearances on a few tracks from (The Dresden Dolls) drummer Brian Viglione, violist Nick Shadow, and multi-instrumentalist Chase Dobson… but much of it is my electronics, acoustic guitar & harmonium. There’s an element of textural ambience in the 4-piece movement that covers the first two tracks of the album. Oh!! Talking about music! I can’t wait until you can hear it, instead of reading my words. November 2nd is the street date, we plan to start shipping October 26ish, after packages are in the mail to the 255 Kickstarter backers who made this release possible. Thanks so much everyone, more soon! PS: You might dig this! The new Lycia is coming out on Projekt. That’s right: two of Projekt’s biggest mid-90s band are releasing new albums at the same time! PreOrder IN FLICKERS at the Projekt Website (where you can also get the shirt) or the Projekt Bandcamp page.